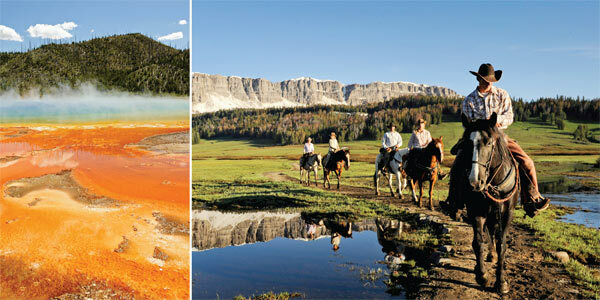 Wyoming family vacations from Adventures by Disney journey though Jackson, Yellowstone National Park and Grand Teton National Park. Discover the spirit of the Wild West while galloping on horseback, shooting down roaring rapids and bonding around campfires under the stars. Travel across mountain ranges and vast unspoiled wilderness on this vacation to remember. Shoot down the rollicking Snake River and feel the thrill of whitewater rafting (Class II-III rapids). As you float along, watch for eagles, herons and osprey! Experience the explosive power of Old Faithful on a privately guided Yellowstone tour and learn about the mysteries of this geological spectacle. Saddle up and explore the mountains on horseback. Then learn to rope, ride, hoot and holler from a real cowboy! On a guided walk, discover amazing natural wonders using heat-seeking laser thermometers. Explore geysers, mudpots and bizarre thermal phenomena. Enjoy authentic accommodations at hotels such as the historic Brooks Lake Lodge, an elegant retreat secluded in the stunning wilderness of Wyoming. Upon landing at the Jackson Airport, meet your Adventure Guide. Relax as a "cowboy" driver "wrangles" your luggage and takes you to your hotel! Unwind from your journey as your Adventure Guides check you into this hotel. This hotel will be home for the next few days. Tonight, meet the other families that will share the adventure. Chow down on some cowboy grub and get ready for your quest! Spend a morning relaxing at the hotel or you may choose to explore the scenic town of Jackson. This "gateway to Yellowstone and Grand Teton National Parks" has many interesting shops and activities for everyone in your family. Enjoy a family lunch at a real, rowdy, old-fashioned theater. Your western-themed meal is capped off with some rootin' tootin' entertainment celebrating the 50th anniversary of this historic landmark. Discover the spirit of the wilderness and shoot down the rollicking Snake River. As you float along, look up into the sky—there may be eagles, herons or osprey watching from above! Spend the afternoon on your own with the family shopping in Jackson for some authentic cowboy gear. Whether you're craving cowboy grub, comfort food or some down-home country cooking, Jackson's has a superb assortment of restaurants. Your Adventure Guide can help you find the perfect family meal to enjoy on your own. *Minimum age 6 years and 45 lbs. for this excursion. Board a ferry for a cruise across the glassy waters of Jenny Lake. Then, hike to an awesome 80-foot waterfall. Unwind with the family under clear blue skies and enjoy lunch in a storybook setting. This picturesque lake is the perfect spot for a picnic to remember. Discover amazing natural wonders using heat-seeking laser thermometers! Explore geysers, mudpots and the bizarre thermal phenomena that make Yellowstone so smokin'. Located near the famed geyser, this contemporary hotel reflects its natural surroundings, with timber and log construction and authentic western furnishings. There are over 1,000 thermal features in Yellowstone, but Old Faithful is by far the most famous. During tonight's on your own time, take a leisurely walk around the boardwalk and uncover the mystery of this strange geological spectacle. And watch in wonder when this gushing geyser bursts! Discover local flavors while spending a relaxing meal with family and friends. 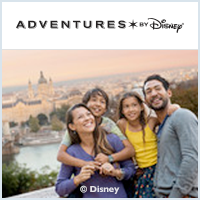 Adventures By Disney is happy to make reservations at either the Old Faithful Snow Lodge or Old Faithful Inn on your behalf. Thar she blows! After dinner, Junior Adventurers can whoop it up during an interactive geyser demonstration outside the Old Faithful Snow Lodge. *All accommodations inside Yellowstone National Park, including the Old Faithful Snow Lodge, were built to reflect the natural surroundings of the environment. Air conditioning, televisions and radios are not available inside the lodge. Internet service is available for purchase inside the lobby, but is generally not available in guest rooms. Quest through glorious Yellowstone National Park on an excursion of The Lower Loop while visiting the awe-inspiring landmarks that have captured the imagination of artists and adventurers alike. Discover magical places like Hayden Valley, Artist Point, the Upper and Lower Waterfalls, and Lake Yellowstone. Discover the strange beauty of fumaroles (steam vents), blue pools, pink mud pots and mini-geysers on a privately guided exploration though Yellowstone's thermal phenomena. Who knew that Mother Nature had such a wild side? This is your chance to gather 'round and grab some grub before heading off to your afternoon adventures. This phenomenon has to be seen to be believed! Hike around the canyon and marvel at the majesty of this magical place. And keep your eyes open for an abundance of animals! As you ride through Hayden Valley by motorcoach, stay watchful for the chance to see wildlife grazing on the vast grassy plains that surround you. Enjoy the quiet elegance of this historic hotel on the lake shore during a brief stop before continuing on your journey to Brooks Lake Lodge. As awe-inspiring as the day it was founded, this historic lodge is an exclusive stay for our Guests and provides a well-appointed base for exploring the surrounding natural beauty. Although the creature comforts of the lodge are many, including a modern spa*, the friendly staff is focused on outfitting you to make the most of your outdoor adventures. Welcome home! Enjoy a home-cooked meal and trade stories about your adventures on the range at this private dinner. *Please note, television and internet service are not available at Brooks Lake Lodge. Spa services are available for an additional fee. Walk in the boots of real cowboys! Learn to rope, ride, hoot and holler from someone who lives the adventure every day. Saddle up and explore the mountains on horseback—there's excitement around every bend! Fill up with a scrumptious selection of soups, salads, sandwiches and desserts — all made with the freshest in-season ingredients. 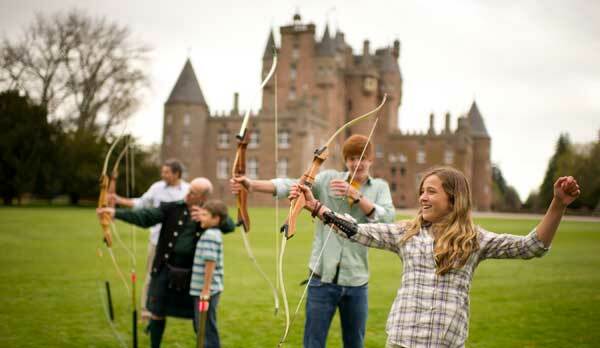 Choose from a wide array of activities that let you take advantage of your scenic surroundings. 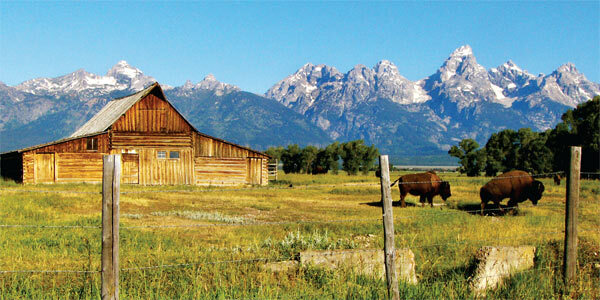 Adventurers can choose a horseback trail ride, archery, fly-fishing, canoeing or hiking. After your exhilerating day in the Wyoming wilderness, mosey on over to the dining room for a relaxing fine-dining experience you won't soon forget. Master Chefs use premium seafood, beef, game and poultry to create spectacular entrees every night — and be sure to save room for a truly decadent dessert! Cuddle up and catch a classic Disney film in a storybook setting. This is a movie night you will never forget! *To go horseback riding you must be at least 7 years old and weigh less than 250 lbs. (113 kg). Bring the family together and explore everything the wilderness has to offer. The fish are bitin' in the lake, horses are ready for ridin' and miles of unspoiled nature is just waitin' to be discovered. Yee-haw! Follow a naturalist guide through the forests and learn about the wild flora, fauna and wildlife that call this place home. You won't believe how rowdy it is out there! Toast to the adventure of the past week, and chow down on one last cowboy meal. Relive your time together and share the memories that your family will cherish for a lifetime! * To go horseback riding, you must be at least 7 years old and weigh less than 260 pounds. Children under 7 can still ride but only on BLL property. Board pre-arranged transportation to the airport and wish your newfound friends "happy trails" until you meet again!